Database Systems Corp. (DSC) provides call processing technology including phone systems that automatically deliver voice messages to thousands of individuals or answering machines. "Sales Management includes features for creating the sales force; organizing the sales force, sales forecasting and sales planning, identifying potential customers, maintaining client information, and creating and managing schedules." This includes sending phone messages to all of the above groups. Information such as sales discounts, new product offerings and discontinued items or out of warranty information can now be broadcast instantly to various target groups. Calls can also be automatically placed to remind customers of ordered product shipments as well as delays. Contact DSC to learn more about our sales management phone services. For a list of other applications and services provided by DSC, please visit our phone applications web page. ING DIRECT utilizes the phone message delivery services at the Database Systems Corp. call center to update both field sales force personnel and sales agent with important sales and marketing information. ING DIRECT sends phone messages containing information regarding upcoming sales seminars and events local to each sales agent. The following announcements are just a few of the many applications of phone message broadcasting within a sales management organization. 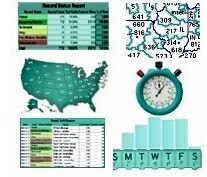 An important feature of our sales management phone service is the ability to produce real time reports and graphs. Our voice broadcasting report system helps you observe and control the performance of your sales management and control program with clear and meaningful displays. Voice broadcast graphs and charts of operational statistics let you measure the effectiveness of each calling campaign as it is running. To view sample sales management reports, please click on the graph to the right.